Join bestselling author and CyberDating Expert Julie Spira at the West Hollywood Book Fair on Sunday, September 26, 2010. 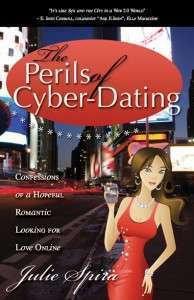 Spira will present and sign copies of her book, The Perils of Cyber-Dating: Confessions of a Hopeful Romantic Looking for Love Online from 10:00am – 12:00pm at Booth E63 and E64. In addition, she will be providing online dating profile critiques and dating advice for singles on the dating scene. “The Perils of Cyber-Dating: Confessions of a Hopeful Romantic Looking for Love Online” is a romantic tell-all memoir spanning over 250 online dates in almost 15 years. The book is filled with heartfelt, witty, and hilarious stories. Julie Spira, a pioneer in the Internet industry, became the first on her block to post an online dating profile. You’ll follow her journey as she skillfully navigates the web, hoping to replace what she once thought was the love of her life with a new Internet mate. Combining her fairytale romances and disappointing heartbreaks with her personal “rules of netiquette,” Spira provides priceless knowledge about the most effective ways to date online.